Pinwheels are so popular among baby led weaners I am so surprised it took me so long to make them for Dex. It’s all I have seen people talk about on baby led weaning groups (also they talk a lot about these banana pancakes.) Obviously you can make your own pastry, but for me it’s quicker and easier to use the ready made kind. Make sure you take it out of the fridge about an hour before you want to use it so it’s at room temperature when you roll it which stops it cracking. 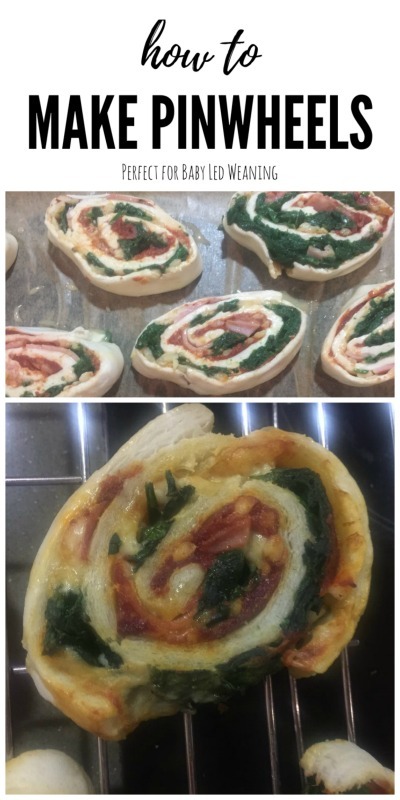 The recipe below makes about ten baby led weaning pinwheels. I started by preheating the oven to 180C and wilting a couple of handfuls spinach on the hob. You can also wilt spinach by putting it in a colander and pouring boiling water over it. While the spinach was wilting, I rolled out my puff pastry and cut it so I was left with a piece the size of an A4 sheet of paper. First I added Cirio Double Concentrated Tomato Puree, spreading it out evenly with the back of a spoon. I sprinkled over grated cheese, the cooked spinach and chopped up pieces of ham. Next, I rolled the pastry, with my hands, creating a Swiss roll. I brushed the pastry with egg wash and then cut it into 1cm slices. Make sure you use a very sharp knife at this point. I placed the slices on a baking tray which I had lined with baking paper and popped them in the oven for fifteen minutes. They will turn a lovely golden brown when they are ready and you will be able to see the cheese bubbling away. Leave them to cool for ten minutes or so before serving to baby. Instead of creating a log which you cut into you could also start by cutting thin strips out of the pastry, adding the topping then rolling. Both methods are easy enough but I find the second one is less messy. These are so delicious and very filling. I only offered one to Dex and it was completely devoured. The tomato purée gives them an authentic strong tomato taste while the spinach is adding vitamins and minerals to baby’s diet. They are easy for baby to pick up and soft enough to chew and swallow. The pinwheels can be kept in the fridge for three days or frozen. Just make sure they are fully cooled before refrigerating or freezing them. There are so many variations to this recipe out there, the world is your oyster where pinwheels are concerned, you could try sweet ones using peanut butter or Nutella or try recreating a cheeseburger by adding mince, cheese and salsa. The possibilities are endless. 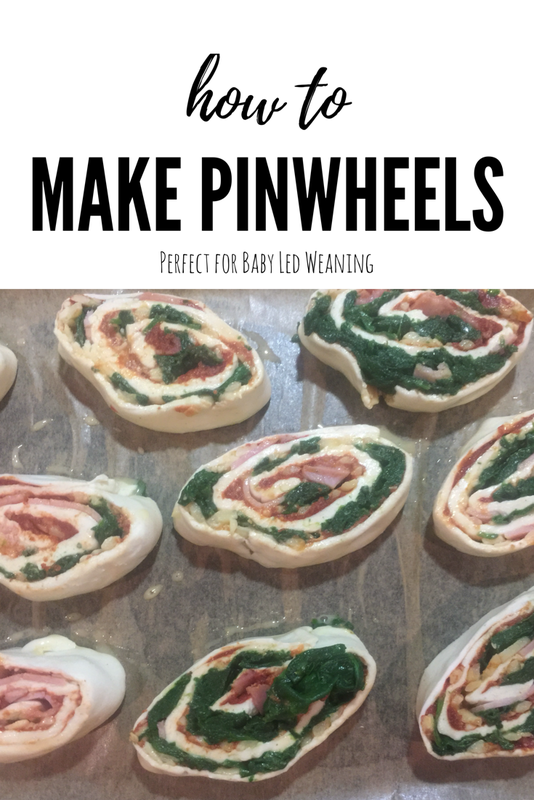 Let me know which baby led weaning pinwheels you try. Wow, these look delicious. Once we get the reflux under control we’ll be trying these for real. Which way do you roll the pastry up? Using the shortime side or the long side? Sorry for my baby brain question! Finally got around to trying these and both me and the little one loved them. I’m looking forward to trying out more combinations! Ah fantastic! You have to try banana and nutella! Hi. What age do you recommend giving these from?